British acts have filled the top 10 best-selling artist albums in 2014 for the first time, according to new figures from the UK music industry. Singers including Ed Sheeran, Sam Smith and George Ezra have pushed US artists from the annual list. An increase in music streaming has also pushed UK sales to more than £1bn, according to official data. Nearly 15 billion songs were streamed from digital services such as Spotify, Deezer and Google Play in 2014. That almost doubles the number of streams in 2013. Streaming now accounts for 12.6% of all the music consumed in the UK - and 17% of retail music spend. British acts fared well, with four of the top five most-streamed artists hailing from the UK, topped by Sheeran and Smith. The Arctic Monkeys and Calvin Harris were also in the top five. The figures for 2014 were compiled by the Official Charts Company and released by the British Phonographic Industry (BPI). Sheeran's album x was the most popular album of last year, selling 1.7 million copies, the biggest one-year total since Adele's 21 in 2011. 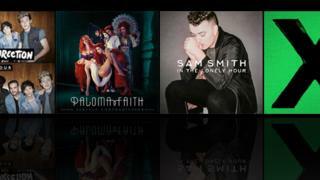 Smith's In The Lonely Hour sold 1.25 million copies. It is the tenth year in succession that the year's biggest-selling artist album has come from a British act. The growth in music streaming is predicted to continue in 2015, with Apple expected to give an extra push or a possible relaunch for the Beats service it acquired last year. YouTube is also set to launch a new music subscription service. Despite an 8% decline in sales of CD albums, sales of vinyl records reached almost £1.3m. That figure marks a 65% increase in this small market, with Pink Floyd's The Endless River and AM by Arctic Monkeys among the big sellers. Geoff Taylor, chief executive of the BPI, said: "The remarkable success of British artists in 2014 is exciting news for the future. "Our record labels are backing home-grown talent like Ed Sheeran, Sam Smith and George Ezra, who in turn are catching fire around the world." The Official Charts Company, which compiled the figures, was unable to find another all-British annual album top 10 in its research. The Now That's What I Call Music series continued to generate huge sales with Now 89 the biggest selling compilation of the year and the third biggest-selling album overall. Disney's Frozen soundtrack is the second biggest various artists release of 2014.